Don Milne here, your Roadtrip-'62 ™ traveler, pressing on with our fourth day of travel along historic US-6. Yesterday I didn’t make it into Connecticut, but today I’ll be stopping in the Hartford, Connecticut area. We’re leaving Providence, Rhode Island, and our virtual roadtrip will make several more history stops today, along with some pleasant parks. As usual, we’ll also find a few surprises. If you see anything you like, get yourself out on the road and enjoy it in person. This virtual roadtrip may be fun, but there's nothing like the real thing! At any time, click on an underlined word below to learn more about the places on the trip. Time for me to grab the wheel and go! For breakfast, I’m going to follow the recommendation of online acquaintance Tim Lehnert and head for Wein-O-Rama. It’s located just 4 miles south of town, in Cranston, Rhode Island. It opens at 7:00am and the reason I’m stopping is that it first opened in 1962! Now, I’m not having hot dogs for breakfast, but they also serve standard diner breakfast fare including home fries. 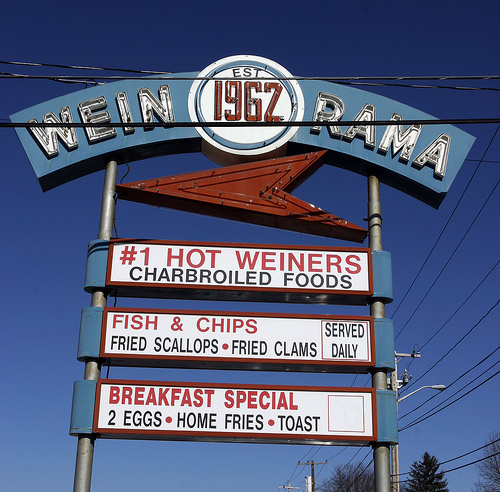 However, if you want to try the weiners, which is really the main reason this place exists, they’re served in a way you probably won’t find outside of the Northeast. They’re covered with a Greek-spiced meat sauce, yellow mustard, raw onion, and a sprinkle of celery salt. Bon appetite! Before I leave Providence, I’m going to visit Brown University’s John Carter Brown Library. They have a fine historical map collection, and I’ve always been in love with maps. The collection was established at the university in 1904, comprising the private collection of John Carter Brown, so we could have visited in 1962. The core of the collection is from Colonial times and includes many maps of the European discovery of America. They create a variety of exhibits that showcase the maps in the collection, with one recent exhibit telling the story of Scientific Travel in the Caribbean. If you have a specific document you want to see, you can register and request items after reading the policies. One that sounds interesting to me is the Scull and Heap Map of Philadelphia of 1752. This was the first map of that city to be engraved and printed there, and shows Philadelphia just seventy years after its founding. You can go look around the exhibits while I pour over the map. There are still more historic sites in Providence that have been here since at least 1962, such as the Museum of Art at the Rhode Island School of Design, an 1828 indoor shopping mall known as The Arcade, and the first Baptist Church in America, but it’s time for us to head west or we’ll never make Hartford. Route US-6 is still only a two-lane and four-lane road through the remainder of Rhode Island, though various plans have been advanced over the years to upgrade it to a freeway. Strangely, when the interstate freeway system was planned, no direct route connecting the two state capitols of Providence and Hartford was included. This road is very old, with parts of it laid out along an Indian trail in the 1670s. It also served French General Rochambeau in his march during the American Revolution. But today, most of it is a rural byway. Now that we’re out of the metropolitan area, let’s enjoy one of Connecticut’s best short hiking trails. Just across the state line, Old Furnace State Park in South Killingly has been a park since 1909. At that time it was a municipal park, but in 1918 the town sold the land to the state, which has since added more land to form the park we have today. The name of the park comes from an old iron furnace used during the American Revolution to produce horseshoes and other iron goods. Iron ore was found nearby. You can still find some remnants of the furnace operation down by the creek, but many early features have been lost over the years to the landscaping. The hiking trail begins opposite the picnic area and leads through pine forest gently uphill. About ¾ of a mile along, a panoramic view from 200 feet above the valley provides views back into Rhode Island. The full trail is 3-miles long. It’s unfortunately too early for a picnic here, unless you spent more time back in Providence than I did. As is often the case in small towns in the northeast, Brooklyn, Connecticut has a monument to a Revolutionary War hero. The Israel Putnam State Monument was dedicated in 1888 and honors a Massachusetts general who served in both the French and Indian War and the Continental Army. General Putnam is buried under the monument, whose sculpture was designed by sculptor Karl Gerhardt. Mr. Gerhardt is also responsible for many Civil War monuments in New York and New Jersey. Route US-6 in this area is part of The Revolutionary Road, used by the Continental Army in at least five campaigns. Some sections are now four lanes and even divided. As it drops back to two lanes, we pass the James L. Goodwin State Forest near Hampton, Connecticut. Back in 1962, this was still a privately owned forest, producing lumber, Christmas trees, and fruit on its orchards. The owner, James Lippincott Goodwin, donated nearly three square miles of property to the state in 1964. Maybe we could have stopped for some apples or other produce. 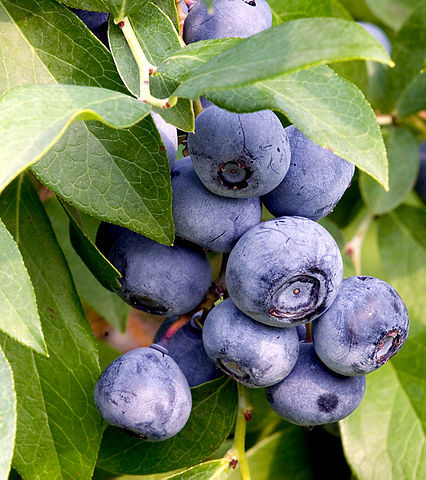 Come to think of it, there are lots of farmers’ markets and pick-your-own farms in Connecticut today and we should stop for some fresh blueberries! The Connecticut Department of Agriculture lists farmers’ markets in Brooklyn and Hampton. And there are at least four farms just off US-6 here in Windham County, including Chaplin Farms, Creamery Brook Bison, and Palazzi Orchard. Depending on the season, we can pick apples, blueberries, strawberries, plums, peaches, nectarines, or pears! The Windham Textile & History Museum in Willamantic, Connecticut is in the former headquarters building of the American Thread Company. The company operated here until 1985 and four years after it closed the museum opened. Other mill buildings are now redeveloped for residential and commercial uses, while the developer donated the headquarters building to the museum. Though we couldn’t have seen the museum back in 1962, we could have purchased the company’s product. American Thread was one of the main competitors to the more well-known Coats & Clark threads. I’m holding out for a picnic later, but if you want lunch here, there are a couple of authentic diners you might choose from. Mickey's Windham Diner dates from 1950 and operated here until 1971. It was then moved twice to other cities in Connecticut and returned to Willimantic in 2005, using the original name. Also, The Trolley Pub is in a diner built around 1930. The section of US-6 from the US-6 freeway west of Willimantic to I-384 in Bolton is known as "Suicide 6." An average of two people were killed each year on this 10 miles of road during the late 1990s, one of the most hazardous roads in the United States. The road headlined a 1998 segment titled "Unsafe Roads" on the TV news show "Dateline NBC." Connecticut applied for a permit to build a freeway here in 1979, but infighting among the federal government agencies of EPA, COE and FHWA has stalled the project ever since...meanwhile more people die. As an alternate back in 1962, ALT US-6 ran from Willimantic to Southbury, Connecticut and completely bypassed the Hartford area. In 1967, that route was renumbered CT-66. I won’t be heading that way, but if you do you might stop at the Wadsworth Falls State Park or Quassy Amusement Park in Middletown, Connecticut, or the Mattatuck Museum or Timexpo Museum in Waterbury, Connecticut. Wadsworth Falls State Park was designated as a park in 1942 and besides the falls it also contains remains from water powered industries. Quassy Amusement Park has been providing fun for middle Connecticut for 104 years! The Mattatuck Museum was established in 1877, showcasing the works of Connecticut artists, and has moved to larger buildings several times over the years. Timexpo, while too new for our 1962 timeframe, nonetheless highlights a brand that was well known both then and today. I once owned a Timex watch and I imagine any of you over 40 did too. It’s hometown, Waterbury, has been known as the Brass Capital for decades. The building that houses the museum is the former executive office of the Scovill Manufacturing Company and Century Brass Company, and is the only remaining building of the former sprawling brass mill complex. Waterbury Clock Company was the forerunner of today’s Timex Group and owes its origins to the local brass industry because this clockmaking company was founded as a department of the brass manufacturer Benedict & Burnham in 1854. Just north of Bolton, Connecticut is a last chance to enjoy nature before we hit another big city. Bolton Notch State Park has hiking trails, including a well-maintained trail along an old railroad bed that is adjacent to unused power lines. You can still see some of the old utility poles in the forest along this wide and flat trial. Up at the top of the "notch" there is a marble exposure along a cliff with several caves large enough to climb into. I’ll also have that picnic lunch now, with those blueberries for dessert. How about some Underwood Deviled Ham on a sandwich? I used to think this was pretty neat when I was a kid, even though we never bought it (probably cost too much). I think I just liked the idea of meat in a can because of Spam. When I first went grocery shopping on my own though, in 1972, I began buying it for picnics and still do today. Maybe I should top it off with a Kraft Swiss Cheese Slice. Actually, I never even knew it came in other flavors like brick and swiss until I researched it, because back in 1962 we only bought Kraft American Cheese Slices! To go with the sandwich, we’ll need some milk from a local dairy, such as Dart's Dairy of Manchester Connecticut, or Fisher Bros. of nearby Putnam Connecticut. Milk nearly always came from less than 50 miles away back in 1962, but most of those local dairies have closed or merged with large regional dairies now. After lunch, as we leave the park we meet up with US-44 again and ride with it into Hartford. The Lutz Children's Museum in Manchester, Connecticut was founded by the local PTA in 1953. It’s named to honor Hazel Lutz, an art teacher who was also a world traveler. She began the collections, storing items in a closet of her schoolroom, until the Board of Education offered the museum its first home in the basement of Waddell School in 1953. They have moved several times, needing a larger building each time. This makes it one of the rare children’s museums we could have seen in 1962: most were not established until the 1980s or later. The museum is a member of the Association of Children's Museums, so that members of other museums that participate receive free admission. In East Hartford, Connecticut, we meet another US-numbered route, US-5. This one of the shorter US-numbered routes, running though only Vermont, Massachusetts, and Connecticut. Today it runs close to I-91 for it’s entire length. In the Hartford area, US-6 came in from the east on Silver Lane in 1962. We would have then crossed the Connecticut River on the Charter Oak Bridge with US-5. Our US-6 then continued on a rather discontinuous route along Airport Road, Brown Street, and Colt Highway, west to Farmington. This route is now difficult to find without a detailed map of Hartford, and was abandoned as US-6 in 1969, when the route was shifted to run along the I-84 freeway. It won’t be too important for us anyway, as I’ll be wandering all over town to see the many interesting sights we could have seen in 1962. As I mentioned in the first Roadtrip-'62 ™ trip down US-23, when we went through Columbus, Ohio, my wife and I love gardens! So I’m starting my visit at Hartford’s Elizabeth Park Rose Gardens. This rose gardens encompasses about 15,000 bushes, is the center piece of Elizabeth Park, and is the oldest municipally operated rose garden in the country. I’m not sure what shape the gardens were in back in 1962, as by 1977 they had fallen into disrepair. The Hartford City Council faced budget cuts that threatened to eliminate the gardens altogether. That year, the Friends of Elizabeth Park, now the Elizabeth Park Conservancy, was formed and they raised funds to renovate and improve the gardens and buildings. They continue to provide maintenance funds and volunteers so the roses and other gardens in the park can be enjoyed today. The rose garden is one of only 22 public All America Test Gardens in the country, where you can see the roses of tomorrow being test grown today. Something to drive by (or actually through) is the Soldiers And Sailors Memorial Arch in Bushnell Park. This is a grand triumphal arch of brownstone and terra-cotta, designed by architect George Keller and featuring the sculptings of Casper Buberl, Samuel Kitson, and Albert Entress. It was built as a Civil War monument and dedicated in 1886. And yes, Bushnell Park contains yet another carousel, this one built about 1914, as just about every big city we travel through in New England does! After the pleasant drive through Bushnell Park, we’ll stop at the New Britain Museum of American Art. It began as the Art Museum of the New Britain Institute, which opened to the public in 1937, having grown from merely an "art room" at the New Britain Institute. That would have been the building we saw in 1962. Today, the museum houses an art collection dating from 1739 to the present in a building opened in 2006. It includes oil paintings, drawings, prints, sculptures, photographs and illustrations. Plenty of space for us to wander through different rooms if your art tastes are different from mine. In case you’re wondering about all the skyscrapers downtown, Hartford was headquarters of many insurance companies, and insurance remains the region's major industry. The city has been nicknamed the "Insurance Capital of the World." Of course, there is The Hartford, which was incorporated in 1810 as The Hartford Fire Insurance Company. There is also the home office of the Aetna Life Insurance Company, which began operations about the same time. The Aetna headquarters is right across the street from the Cathedral of St. Joseph, which we’ll see later today. The tower of The Travelers Companies is one of two headquarters buildings for that company (the other is in St. Paul, Minnesota) and is the tallest building in New England at 527 feet high. The Phoenix Companies began here in 1851, with its oldest predecessor insuring only people who abstained from alcohol! They occupy a sleek mirrored-glass tower downtown. Many other nationally known insurance companies also have major operations in the city. Well, before the day ends I wanted to see the Mark Twain House and Harriet Beecher Stowe House, which are next-door neighbors. The Mark Twain House comes with a museum adjacent, so I’m going to stop into both. Samuel Clemens, know to us as the writer Mark Twain, and his family lived in the house from 1874 to 1891. During these years, he wrote his most important works, including A Connecticut Yankee in King Arthur’s Court (how fitting), Adventures of Huckleberry Finn, and The Adventures of Tom Sawyer. Clemens’ first literary break after years of various careers came when his short story‚ "Jim Smiley and His Jumping Frog" was published in newspapers across the country in 1865. After he became successful, he moved his family to Hartford because he had come to love it while visiting his publisher there and his wife had family connections to the city. Just this year I read his complete short essays and found them to still be a fun read 130 years or so after they were written. The house was designed by New York architect Edward Tuckerman Potter under the strong design guidance of Clemens’ wife Livy. Construction began in August 1873, with the family moving in before the house was completed. The author later called the year he lived here the happiest and most productive years of his life. Due to the death of one of his daughters in the home in 1896 while he and Livy were traveling, Sam and Livy never returned to the home afterward. The house draws inspiration from other cultures such as the Middle East and Asia, giving a truly unique feel. It contains the typical interior detailing of the mansions of the times, including leather-covered walls, silver and gold paint, specially-designed wallpapers, and architectural details purchased from a castle in Scotland. Rooms include a billiard room where Sam Clemens spent many hours just knocking the balls around. The museum building is of course much newer, opened in 2003. It offers more about Mark Twain, his family, and the house. The museum also shows a Ken Burns mini-documentary on Twain. Another American author’s home is just about next door, the Harriet Beecher Stowe House. She is best remembered for her 1852 novel, Uncle Tom’s Cabin. The novel was strongly anti-slavery and helped establish Stowe as a social reformer. The house is Victorian Gothic in style and dates from 1871. The museum in the house holds the largest collection of material related to her extended families and other residents of the Nook Farm neighborhood that includes the Twain house. The collection has been developed around the nucleus originally collected by the late Katharine Seymour Day and includes Harriet Beecher Stowe's personal correspondence, first editions of her works, and specialized collections on 19th-century women's history, 19th-century slavery, and 19th-century architecture. After leaving the museums, I’m stopping to pick up a copy of The Hartford Times to read during dinner at the diner. The Hartford Times was published from 1826 to 1976, so we can’t buy one today but we could have in 1962. Many newspapers have merged or gone out of business since 1962. That year, their editorial cartoonist, Edmund S. Valtman won a Pulitzer Prize for his 1961 cartoon titled "What You Need, Man, Is a Revolution Like Mine." It was a poke of the recent revolution led by Fidel Castro in Cuba. Valtman was noted for his caricatures of Cold War-era communist leaders. Time for dinner, as I noted, at the diner. There are several diners in Hartford, and one was just down the street in 1962. The Aetna Diner was the first name of a 1949 Paramount model diner just 2 blocks east of the Mark Twain House on Farmington Avenue. Over the years, it was the Hog River Grille, the Comet Diner, the Oasis Diner, and most recently, Dishes Restaurant. Dishes was closed when I visited Hartford in 2011, so we’ll have to look elsewhere in the city. The Quaker Diner out in West Hartford won’t work for us, as it’s only open for breakfast and lunch. The Gold Roc Diner, also in West Hartford, is too new for our time period, though I’ve read some great reviews on it. I think I’ll try the Tastee Diner on Main St. It was originally the Terry Square Diner, then Hal's Aquarius Café, and until 2009, the Rajun Cajun Restaurant. Check out Roadside Architecture for more information on diners, signs and more. Someplace beautiful you can visit after dinner is the Cathedral of St. Joseph. It’s just 5 blocks east of the Mark Twain House on Farmington Avenue and right across the street from the Aetna Life Insurance Company headquarters. The cathedral is celebrating its 50th birthday in 2012, having been dedicated in May of 1962. It replaced the original cathedral on the same site, which burned down in 1956. This new building fits the style of the early 1960s perfectly, with clean lines but retaining obvious decorative touches of old world cathedrals. Later church buildings became almost unrecognizable as churches, and indeed today many are nothing more than the same steel engineered buildings used for commercial and industrial uses. St. Joseph’s, however, has magnificent glass art portraying scenes from the Gospels. Twenty-six windows composed of prism-like chips set in concrete make up the bulk of side walls. And Christ the King is depicted in huge glass panels over the entrance and its bronze doors. The windows were executed in Paris, France by Jean Barillet. The huge bronze front doors contain a 46-foot frieze, depicting St. Joseph, the Patron of the Archdiocese of Hartford. A nearby panel bears a representation of Pope John XXIII, who was Pope at the time of dedication. You are free to wander about the interior but please respect it as the place of worship that it is. Another place you can go after dinner, when most places are closed, is the Ancient Burying Grounds. This four-acre cemetery is the oldest historic site in Hartford, and the only one surviving from the 1600s. Beginning in 1640, just four years after the arrival of the first English settlers, and for almost 200 years, anyone who died in town regardless of age, gender, race, ethnic background, economic status, or religious faith, was interred there. Even though over 6,000 people are buried there, because gravestones were expensive the majority of people never had one. In 1835 there were only 563 stones in the Ancient Burying Ground, and today, about 415 are still standing. Time to turn in for the night. Let’s listen to some 1962 music as I cruise around looking for the ever-elusive old motel that’s still in good shape. Gene Francis Allan Pitney was born in Hartford, Connecticut in 1941, and as Gene Pitney he had a #1 hit with the movie song "Town Without Pity" in 1961. That song was from the film of the same name starring Kirk Douglas, and was nominated for an Academy Award for Best Song. He sang it at the 34th Annual Academy Awards in 1962, becoming the first pop singer to sing at the ceremonies. He also had a #1 hit with "Only Love Can Break A Heart" in November of 1962. But let’s listen to a slightly more obscure song with a Hartford connection. The Paris Sisters were from San Francisco and grew up singing together, emulating The Andrews Sisters. They recorded together in the late 1950s but had no spectacular success. In 1961 a young Phil Spector was assigned to produce the girls and by the end of the year they hit it big with "I Love How You Love Me." They acquired their special Hartford connection in 1962 when the B-side of their #34 song "He Knows I Love Him Too Much" charted locally in the Top 50 in February. It was written by Phil Spector and Cory Sands and produced by Phil Spector. We’ll finish seeing Hartford tomorrow on Roadtrip-'62 ™ , but here’s what the folks in Hartford enjoyed listening to in 1962.